Jennifer Lopez helped Audi go big in Dubai as the German automaker has opened their biggest car dealership in the world that sounds more like an amusement park. Forget the Burj Khalifa which is the world's tallest structure in the world, underwater hotels, manmade islands and huge shopping malls, the city of Dubai is now home to the world’s biggest and baddest Audi dealership in the world. 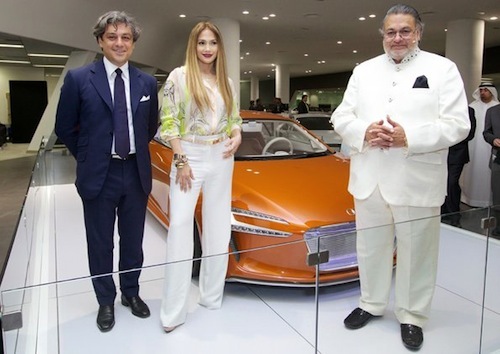 Jennifer Lopez was on hand with Luca de Meo, Member of the Board of Management of AUDI AG for Sales and Marketing, and K. Rajaram, Chief Executive Officer of “Al Nabooda Automobiles” to help open the gigantic auto plaza. Buyers also get to experience two large elevators that transport the new Audi models between the levels. For those who have the money, the second floor is reserved for the Audi “exclusive portfolio.” It includes extensive color and material samples and a personal consultant from quattro GmbH. High-end customers will be able to design their very own one-of-a-kind Audi. Audi says this kind of service is in especially high demand by Audi drivers in the markets of this region. The Audi Terminal will also feature floor-to-ceiling screens that show the Audi model range including all equipment options, features and technical details in a lifelike 1:1 scale. There will be a “Powerwall” digital technology presentation similar to the recently launched “Audi City” store concept in London. Another exclusive offering at the Audi Terminal will include a prayer room for customers and employees in the Muslim country. AUDI AG developed its master plan together with the Munich-based architecture agency Allmann Sattler Wappner Architekten. This one of 400 buildings around the world that the agency has built that features this bold architecture with folded aluminum facade and curved display areas. Audi’s first terminal was opened in 2008 in Sydney, Australia. Jennifer Lopez helped Audi open the “Disneyland” of Audi Dealerships in Dubai, and if you have the money, the Audi “exclusive portfolio.” should be a fun place to design a one-of-a-kind Audi.